by David Zanze • A quality PBM can answer questions and provide guidance to make sure that your client is maximizing the benefits of self-funding their pharmacy program. by Robin Gelburd • To weigh the pros and cons of self-funding in a meaningful way, your clients will need a comprehensive understanding of the many moving parts involved — an understanding that can best be supported through trustworthy, independent data. Dental Survey–You Know the Drill! Our Annual Dental Survey California’s top dental providers answer crucial questions about their benefits, features and services. 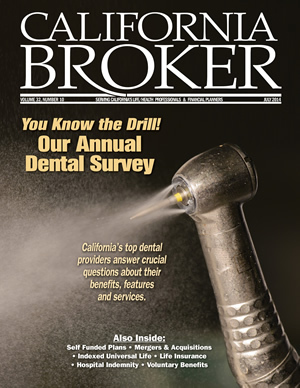 Welcome to Part I of California Broker’s 2013 Dental Survey. We’ve asked the top dental providers in California to answer 28 crucial questions to better help you, the agent, understand their benefits, features, and services. Look for Part II in the August issue. Read the responses and sell accordingly. by Jen Scales, ABD • M&A transactions are on the rise, and with the higher volume of deals comes fresh awareness about some of the related pitfalls. While sellers often provide accurate information in representations & warranties, mistakes can happen, and those mistakes can result in costly liabilities on both sides. by Zachary G. Cole • If you’re using IUL with clients, you’ve discovered its flexibility and value. If you haven’t, it may be time to put this Swiss Army Knife in your tool kit. Have You Heard How to Grow Your Voluntary Business? 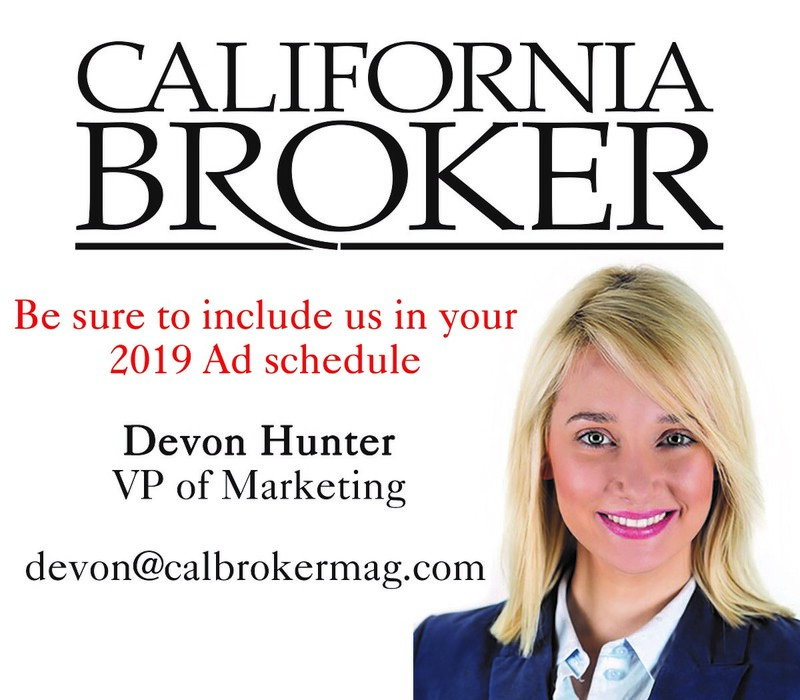 by Stacy Maloy • In the past California employers preferred to offer HMOs and were slow to adopt high-deductible medical plans. They are now starting to move to these plans. Clearly, hospital indemnity insurance is a needed and valuable product that gives employees an easy and affordable way to protect both their family and their finances. One: Best Pricing Evaluate how the PBM arrives at its pricing. As PBMs grow bigger and more powerful, there is a lot of opportunity for them to take advantage. For example, PBMs have been known to steer participants towards more expensive medications because it drives higher rebates. It is important to find a PBM that is willing to share its pricing structure and offer you some transparency. PBMs offer a variety of pricing structures — most commonly traditional or pass through. With a traditional pricing structure, the PBM provides a fixed guaranteed discount and shares a portion of the rebates with the client. The PBM’s revenue comes from pricing spreads and rebates. A spread is the difference between what the PBM charges the client and what it pays the pharmacies, and it can be a substantial. With a pass-through model, the client is billed exactly what the PBM pays the pharmacy, and the client receives 100% of the rebates. In this model, PBM revenue comes from administrative fees. Regardless of the pricing structure, you want a PBM that is aggressive with pricing and willing to demonstrate, at least in part, how and why it will save your client more than the competition will save them. It is important to evaluate all the components of the PBM’s pricing to determine how the PBM will reduce your client’s costs and manage the ongoing drug trend. Two: Flexibility Some PBMs are more flexible in plan design, reporting, and the -ad-hoc customization that’s needed to make your client’s plan run smoothly. While many PBMs limit personalization, some are receptive to their client’s needs and can make changes quickly and effectively. Not all PBMs are created equal; size and business model will determine the kind of service flexibility you will receive. To get a good indicator of a PBM’s flexibility, evaluate how it responds to your client’s needs up front. Before approaching a PBM, list all of your client’s needs. Can the PBM accommodate these needs? For example, to make sure that participants are not inconvenienced during a plan change, your PBM should have a comprehensive network that includes major chains as well as independent pharmacies. Would not having a particular pharmacy affect the employee population? If so, is the PBM flexible enough to provide direct contracting services for any one pharmacy? Being able to meet your client’s needs quickly and effectively should be high on your priority list when evaluating PBMs. Three: Reporting You can’t manage what you can’t measure. Clear, consistent, and timely reporting is essential to managing your client’s pharmacy costs. How would you know if medications were being given to people who didn’t need them, if more expensive medications were being utilized when there were known and cheaper alternatives, whether claims payments were calculated incorrectly, or whether patients were abusing or not taking their medications? Without timely reporting, it’s impossible to assess your client’s pharmacy plan appropriately or determine the negative effects on plan costs. It’s important that your PBM’s reporting system works for you and your client. Your clients should be able to access data in real-time, and reports should be simple and easy to interpret. Four: Guidance It is important to find a PBM that you feel confident will look out for your client’s best interests and be a valuable business partner. Does the PBM have a service strategy to help manage your client’s pharmacy plan? Is the PBM staying on top of various marketplace trends? Specialty drugs comprise over half of the pipeline of new prescriptions coming to market. Your PBM should be negotiating the best pricing for those drugs and developing systems to manage those drugs effectively for your client. A quality PBM will monitor your client’s utilization reports regularly. It will have experienced account management and clinical advisors on staff to make appropriate recommendations. These representatives can answer questions and provide guidance to make sure that your client is maximizing the benefits of self-funding their pharmacy program. Five: Stability Getting consistent service is a big issue because of the frequent mergers and acquisitions in the PBM marketplace. It’s important to look for a PBM that offers stability. Any acquisitions or changes in the infrastructure, claims processing system, mail order vendors, pharmacy networks, or formularies, will affect the PBM’s ability to provide continuous service. Unstable operations will result in disruption to participants, lack of valuable data, and possibly increased costs. If your client moved to the PBM at your recommendation, it could also strain your relationship. It’s important to ask about planned acquisitions or consolidations up front. While the PBM may not be forthcoming about an acquisition until it is made public, you can try to protect your client with performance guarantees. Performance guarantees allow your client to negotiate money back from the PBM for poor performance. It may also be a good idea to negotiate contract language that allows your client to terminate if the PBM is acquired after the decision to move forward is made. Before sending out your request for proposals, make sure that you understand all of the nuances of your client’s pharmacy plan so that you can evaluate responses against known metrics. Most importantly, you will need to know where your client stands with pharmacy costs and how a change will affect their employees. Reviewing current claims data will give you and your client a better picture of overall expenses and plan utilization. It will also mitigate or prevent disruption. It’s also important to know what features your client would like to keep or improve upon with their PBM. Ask what isn’t working and what could be better, as well as what works since those areas are often taken for granted. Lastly, PBMs often have contracts that can be difficult to understand and contract definitions that can be vague or undefined, which can lead to higher costs for your client. Involving an expert, such as a pharmacy benefit consultant, can help you assess terms and review your client’s current plan with other options in the market to make sure that your client gets the best possible deal. David Zanze has over 30 years’ experience serving as a leader and innovator in the healthcare industry. He is the current president of Pinnacle Claims Management Inc., an all-inclusive third party administrator (TPA), and Pinnacle Rx Solutions, a pharmacy benefit manager. Both companies offer competitive, cost efficient benefit administration and claims processing in tandem with the latest technology in the self-funded marketplace. Pinnacle also provides administrative support for Covered California’s Small Business Health Options Program (SHOP) and assistance for the Covered California Certified Insurance Agent community. For more information call 866-930-7264 or visit www.pinnacletpa.com to learn more. Amid climbing premium rates and the Affordable Care Act’s (ACA) rapidly approaching employer mandate, more and more employers are considering moving away from traditional group health insurance to self-funded plans. From 2000 to 2013, the proportion of partially or fully self-funded employer-sponsored plans jumped from below 50% to more than 60%, according to the 2013 Kaiser/HRET Employer Health Benefits Survey, and the numbers continue to grow. While self-funding offers employers more flexibility and control in designing and financing their plans, there is considerable financial risk, and it is not right for every employer. Brokers will need to educate their clients to make sure that they don’t make these complex decisions in the dark. Trustworthy, independent data can a help your clients understand their options and analyze the risks and benefits. Selecting the most appropriate and highest-quality data source is a crucial first step. The best data sources are independent, comprehensive, current, and geographically relevant. Your clients will need a data source that can be configured so since each employer is different and self-funded plans are not one-size-fits-all. How Can Independent Data Help My Clients? An impartial data source can help your clients better understand the cost implications of becoming self-funded, and be the basis for thoughtful planning and benefit design. Independent data can support your clients’ decision-making in these five ways: 1. Designing the Plan — Employers pay a set premium when they purchase a traditional group health plan. But with a self-funded plan, they pay their own claims directly. Trustworthy claims and utilization data can help them make informed decisions about the kind of plan to offer. Will they provide out-of-network benefits? Will employees have a single plan or choose from a tiered benefit structure? What employee co-pays and cost sharing will be required? It can be useful to have comprehensive outside data on how much other employers and insurers in the area are paying for services and the cost of out-of-network services. The data can also provide a picture of which services or conditions employers may expect to spend the most on. 2. Developing a Provider Network – Clients who are exploring self-funding will need to consider whether to contract with a provider network or build their own. Independent data can help them estimate the costs. Comparing utilization and practice patterns in the communities where employees live and work can allow your clients to see what they may expect to pay for services and where providers’ charges fall within area averages. If they decide to contract directly, these analyses can inform their fee schedules and give them a solid basis for negotiating with providers. 3. Predicting Trends – Self-funding carries significant financial risk since your clients will pay claims directly rather than paying a set premium. A few high-dollar claims can make the difference between saving and losing money. Filing a claim is likely to drive the premium higher even if an employer has stop-loss insurance. Some costs will be inevitable, but employers can avoid most surprises by using geographically tailored data to forecast trends. They can compare their own claims and utilization data to geographical norms in the communities where their employees live and work. These analyses can help your client predict which costs are most likely to grow and highlight how their employees differ from the general population. For instance, to determine where they are most likely to incur high costs, your clients could examine the 30 most frequently performed procedures or the 50 most expensive procedures in their area. 4. Engaging Employees – Your clients can create tools that offer simple comparisons of employees’ plan and benefit options and use area cost ranges to put the value of their plans in context. Employers can use the data to educate employees about the costs of their treatment and what may be involved. For example, your clients could create condition profiles for employees that predict a typical annual course of treatment for Type II diabetes, or another chronic condition. 5. Designing Wellness Initiatives – Self-funded employers are well positioned to take advantage of the ACA’s wellness incentives. Comparing employer-specific information to area data can support efforts to improve employee health while controlling costs. For instance, an employer may design a program that addresses heart health if a local demographic profile reveals a high number of stents and cardiac procedures. Comparing before and after analytics alongside benchmark area data, can also help employers track the effectiveness of their programs. A comprehensive data source can help your clients assess their choices and predict costs. It can also help them decide how to manage costs, mitigate risk, and support their employees’ needs for years to come. To weigh the pros and cons of self-funding in a meaningful way, your clients will need a comprehensive understanding of the many moving parts involved — an understanding that can best be supported through trustworthy, independent data. Robin Gelburd is president of FAIR Health, Inc., a national independent, not-for-profit corporation whose mission is to bring transparency to healthcare costs and health insurance information through comprehensive data products, consumer resources and research tools, all powered by the nation’s largest collection of medical and dental claims data. California’s top dental providers answer crucial questions about their benefits, features and services. • Aetna Dental Maintenance DMO plan, PPO, PPO Max. •Freedom-of-Choice Plan Design (offering members their choice of two dental plans). •Aetna Dental Preventive Care, Aetna DMO Access, Aetna Dental Care Reward, Aetna •DentalFund (our consumer-directed dental plan), indemnity, Vital Savings by Aetna, a dental discount program. •Aetna ValuePass Card. Aflac: Aflac Dental – voluntary insurance policy – has the simplicity of a Voluntary Individual Table of Allowances plan that pays a fixed benefit amount for each procedure, regardless of what the dentist charges. Ameritas: We have the following types of dental plans available nationwide: PPO, indemnity, voluntary, non-voluntary, groups from two lives and up, individual, consumer driven and cost containment plans. BEN-E-LECT: BEN-E-LECT offers fully insured PPO, EPO, high deductible, pre-paid and self-insured dental plans for the group market. Employer-paid and voluntary plans with multiple network and out-of-network options down to the employee level are available to groups with as few as two lives. BEST Life: In California, we offer employer-contributory PPO, and indemnity dental plans to groups with two or more employees enrolling. Voluntary PPO/indemnity dental plans are available to groups with five or more employees enrolling. Custom dental plans can be offered for groups with 100 or more employees enrolling. Group term life and vision coverage. Blue Shield: Blue Shield provides a wide range of affordable and comprehensive dental products to meet our clients’ needs. From dental PPOs, to in-network only (INO) and HMO plans, our plans offer members a wide variety of plan designs and networks that fit their budget. For individuals/families, we offer a unique dental PPO plan that provides member copayments instead of the usual coinsurance percentages. Our dental HMO plan offers comprehensive benefits with pre-determined member copayments. Finally, our Duo plan offers members dental and vision coverage at a single price. Our plans can be sold with medical plans or on a standalone basis.. For senior members, we offer two comprehensive dental PPO plans for Medicare supplement plan members. There is also a dental plus vision plan package option for Medicare supplement plan members. For groups, our dental PPO, INO and HMO plans are available on a contributory or voluntary basis, can be sold with or without Blue Shield medical plans and are UCR- or MAC-based. BRIGHTER: Brighter offers two unique dental solutions: 1) An administrative services only (ASO) solution that utilizes revolutionary technology to reduce costs for self-funded employers; and 2) a savings-only plan for employees not wishing to purchase traditional coverage. Cigna: We offer a full spectrum of dental solutions, including the Cigna Dental Care® (DHMO) plan, Cigna DPPO plan, Cigna DEPO plan, Cigna Traditional indemnity plan, and Cigna Dental Shared Administration. We also offer product features like Cigna Dental WellnessPlus®, Cigna Dental Waiver Saver®, and CignaFlex Advantage® that enhance our plans. We also offer CignaPlus Savings®, a discount dental program for retirees, part-time or seasonal employees, or anyone else not eligible for insurance coverage. All plans are available on a stand-alone basis. All plans except the discount card are also available alongside medical and/or vision plans. Cigna also has three WellnessPlus features, which can be paired with DPPO, DEPO, or dental indemnity products. Individuals who get any preventive care in one plan year qualify for increased benefits in the following plan year. All plans are available on a contributory or voluntary basis. In addition to WellnessPlus, Cigna offers Cigna Dental Waiver Saver, where customers Class 1 (preventive) services can be waived for maximums and deductibles, providing an incentive for customers to seek preventive care. Delta Dental: Managed fee-for-service, PPO, and DHMO group dental plans; individual DHMO dental plans and group HMO vision plans. Also, in response to the Affordable Care Act, Delta Dental of California and its affiliated companies now offer pediatric and adult dental benefit plans in 27 health exchanges around the country, covering more than 300,000 new enrollees since the inception of the ACA. This required us to design pediatric and family dental plans based on different sets of rules for the federal and state exchanges, for stand-alone versus bundled scenarios, and for differing market conditions. Dental Health Services: Dental Health Services offers high-quality, affordable prepaid (D-HMO) dental benefit solutions for large & small employer groups and individuals. Other plans are also available, including PPO, EPO, indemnity (reimbursement) products for groups of all sizes, and ASO services for self-funded groups. Guardian: Dental PPO (active or passive), Prepaid/DHMO, and Indemnity plans are available on a voluntary or employer-sponsored basis. Dual and Triple Choice, Monthly Switch (between a DHMO and PPO), and Administrative Services Only plans are also available. Guardian specializes in customized plans based on the needs and price points of the employers and employees. Health Net Dental: Health Net Dental HMO (DHMO) plans and dental PPO plans offer robust benefits covering most dental procedures. Dental plans may be purchased with a Health Net medical plan or on a stand-alone basis. In addition, the dental plans may be purchased as dual choice. Contributory and voluntary plans are also available. HumanaDental: PPO, prepaid/DHMO, traditional preferred, and preventive plus plans are available on a voluntary or employer-sponsored basis. Humana also has a robust ASO dental plan available in California. Principal Financial Group: We offer both employer paid and voluntary plans, including PPO, EPO and POS. We also offer a choice between our plans and dental HMO plans through marketing alliances. United Concordia: United Concordia offers flexible fully insured preferred provider organizations (PPOs) and dental health maintenance organizations (DHMOs) plans, as well as an individual product, iDental. ASO funding arrangements are available based on client size. Most plans are offered on an employer-sponsored or voluntary basis. Western Dental: Western Dental offers DHMO mixed-model provider panel comprised of (a) contracted independent, general dentist and specialists, along with (b) Western Dental employee dentist and specialists, who work in the company-owned Western Dental Centers. Western Dental currently operates general dentistry and orthodontic offices throughout Calif., Ariz., and Nevada. Aetna: The key difference between Aetna small group plans and larger group plans is that small group plans are pre-packaged plan designs. While larger groups can select from an array of benefits, the packaged small group plans are comprehensive, yet price sensitive and make it easy for our customers to choose from plans that are competitive in the market. Aflac Dental rates and benefits do not vary based upon the size of the account. Ameritas: Ameritas’ small group and one-life group plans are rated by industry and are pooled in full or in part. Large groups’ experience is rated and includes lower rates in most cases. Ameritas offers a wide variety of plan designs, regardless of group size, to meet the needs of our customers. The pricing of our nongroup individual plans will be higher than group individual because of the nature of the risk. Anthem Blue Cross: There are different underwriting considerations for each business segment depending on the product offered. With our Dental Prime and Dental Complete plans, both small and large groups can customize benefits to fit their employees’ needs. BEN-E-LECT: The majority of BEN-E-LECT’s plans compete very well in the large group market. The benefit design and structure of these plans remain consistent across the small and large group markets. BEST Life: Rates vary by plan design, group size and employer contribution. Typically the larger the group, the lower the rates. However, we offer a lot of plan design flexibility for groups with 10 or more enrolling. Waiting periods for major and ortho services are waived for groups with 10 or more employees enrolling – regardless of employer contribution. Some benefits are standard regardless of size. We offer a dental supplemental accident benefit on all of our dental plans. A child vision benefit is also standard on plans with orthodontic coverage..
Blue Shield: There are different underwriting considerations for each business segment. Our ability to customize offerings for groups with more than 300 employees typically results in lower rates and more choices to meet the employer’s needs. Group plans come in a range of deductibles and annual benefit maximums. Our individual, family and Medicare Supplement dental plans may vary in waiting periods, deductibles, and annual benefit maximums based on the plan selection. All dental plans include generous benefits, competitive premiums, and strong California and national provider networks that are available to all members; we don’t differentiate our provider network for small groups or individual or family markets. BRIGHTER: Our small group plans enable employees to reduce dental expenses for their families by an average of 30 – 50% without paying high dental premiums. So, in any given year they can often receive the same amount of care that they would through a large group plan, and do so at a fraction of the cost they would have otherwise paid through premiums, deductibles & co-insurances. Cigna: Dental plan designs and rates for small groups are similar to those of large groups. There are a series of standard DHMO plan designs and DPPO/indemnity plan designs. Cigna offers an individual plan in the state of California, available as a buy-up option to our medical plan offering. That plan is a DPPO offering, very similar to our group plans aimed at businesses trying to control costs while offering a broad network. Larger groups generally want more robust and flexible plans, while smaller groups gravitate toward standard offerings. We can custom-fit DPPO plans to offer a variety of cost-savings options for employers that want to keep claims costs low, such as missing tooth limitations, class shifting, low maximums, varying coinsurance, deductibles, waiting periods, etc. Our DHMO plans start with basic coverage, specialty discount, split copays, and other cost savings mechanisms and go up to very rich, low-copay plans at the higher end of the cost spectrum, including plans with coverage for surgical implants and related procedures. Cigna can also deliver solutions for the smaller employer segment through the Cigna Voluntary limited benefit dental plan as well as leveraging the small segment capabilities of the former Great West distribution channel. Delta Dental: While benefits offered to smaller groups are comparable to those offered to larger groups, larger groups have more options in terms of plan designs. Rates can be slightly higher for smaller clients and individuals, but Delta Dental strives to be competitive while balancing our financial risk. With individual DHMO plan benefits, we offer three different plan options – two for individuals and families and one customized for seniors. The individual and family plans offer a wide range of covered services. The senior plan is designed to offer services most utilized by this particular population. Guardian: Guardian offers nearly the same plan options to small group employers as to large employers, plus an array of cost-reducing options. We also offer dental benefits through the California state exchange. Health Net Dental: DHMO plans offered to individuals provide a comprehensive schedule of benefits at a monthly fee that is slightly higher than rates quoted for groups. Small groups (two to 50 employees) have two comprehensive Health Net Plus DHMO and 3 DPPO plans from which to choose. Mid-market groups (51 to 250 employees) may choose from five DHMO plans and 15 new DPPO plans. Mid-market rates are based on location, benefit plan chosen, employer contributions, and participation. Individual and small group rates are based on book rates. Risk evaluation is taken into consideration when underwriting larger groups (over 250 eligible employees). HumanaDental: We offer flexible plan designs with a range of deductibles, co-payments, and out-of-pocket expense limits to meet the needs of small to large groups. We also offer large groups the additional flexibility to customize plan options. All our dental plans provide employees with incentives for preventive dental care, which promotes their overall health. Customers who see dentists participating in the HumanaDental PPO Network receive deep discounts. A vision discount program is included with all HumanaDental plans. Principal Financial Group: We do not have individual dental plans. The only significant rating difference between our small and large group rates pertains to experience rating which is used on groups with 150+ employees. The benefits are the same for small and large groups. United Concordia: While larger clients have more flexibility in customizing benefit options than smaller clients, United Concordia offers an array of standard client products and options that provide small businesses and individual consumers with cost-effective, quality choices. To keep the small client premiums comparable to those found in larger clients, slightly higher deductibles, lower coinsurance percentages and lower maximums are more commonplace within this market segment. • Freedom-of-Choice Plan Design — packages our DMO plan with one of our indemnity or PPO plan options. Members pay one rate and can switch between the plans as often as monthly. It can be a lower cost alternative to a PPO plan. • Aetna Dental Preventive Care — a low-cost PPO or indemnity plan covers preventive and diagnostic procedures from 70% to 100%. Members may also get reduced fees from dentists who participate in Aetna’s PPO network for non-covered services like fillings, adult orthodontia, and cosmetic tooth whitening. • Aetna DMO Access — a fixed-co-pay DMO plan offers broader network access at a lower cost. There are no out-of-pocket deductibles for the member to pay and no claim forms to file. It also includes the Aetna Dental Access discount network, which gives members access to more dentists and discounts of 15% to 50% for non-covered services like bleaching. • Aetna Dental Care Reward — By going to the dentist for preventive services in one plan year, Aetna will cover a greater percentage of coinsurance and/or annual maximum next plan year. Aflac: Employers are seeking ways to shift costs and employees are looking for more value. The Aflac Dental plan is designed to increase the policy year maximum, which will satisfy both employers and employees. Ameritas: We are known for our flexibility and expertise in dental. We listen to employers all over the country to learn about their needs. Our plans are updated constantly to meet those needs. We have released several industry firsts including a rollover maximum product; fully insured LASIK eye benefits; dollar reimbursement plans; combined dental/vision deductible,frequency and maximum plans; shared family maximum plans; $5000 maximum plans, and stand-alone hearing care benefits. Our newest individual plan release, vision, is very popular across the nation. Anthem Blue Cross: Yes, our plans are significantly better than previous incarnations. Our Dental Prime and Dental Complete plans are open-access models that include the freedom to see any dentist — with lower out-of-pocket costs at in-network dentists. These plans are better than previous incarnations because they (a) incorporate evidence-based benefit designs and claims processing guidelines, for greater savings and consistency with clinical oral health science, (b) include a more robust California provider network and (c) automatically include access to the national Dental GRID, one of the nation’s leading dentist networks, with dentists in all 50 states. The GRID is exclusively for customers of participating Blue Cross and Blue Shield plans. In short: our new plans have better benefit designs and a larger network locally and nationwide. BEST Life: Our current dental plans offer a lot more options compared to the dental plans we’ve offered in the past. We offer a MAC reimbursement option and all of our dental plans can be tailored to offer rich or lean benefits, depending on a company’s needs. We continually evaluate our dental plans to ensure the competitiveness of the benefits, and our underwriting guidelines. Blue Shield: Yes, we are always looking to enhance our plans and provide richer benefits. For 2014, we are introducing four new group dental HMO plans and four new dental INO plans with a $1,500 calendar year maximum. Compared to our existing dental HMO plans, our new dental HMO plans offer lower copayments to deliver a richer benefit to our members. The new dental INO plans offer a lower price alternative to our INO plans with $2,500 calendar year maximums. In addition to new plan designs, all BSC plans include oral cancer screening coverage as a value-added benefit, which comes at no out-of-pocket cost to the member. We also offer enhanced dental services for pregnant women to all dental PPO plans. Pregnant women receive one additional routine adult prophylaxis, and/or one course (up to four quadrants) of periodontal scaling and root planing, and/or periodontal maintenance if warranted by a history of periodontal treatment. Treatment is payable at 100% of the allowable amount for in and out of network. BRIGHTER: Brighter has introduced the industry’s first Proactive Remittence Organization (PRO) which is a dental care system enabled by our cloud-based platform that streamlines the interactions amongst members, providers and payers to lower claims costs through new efficiencies in benefits payments, network fee schedules, utilization review and group plan designs. Cigna: The new Cigna Dental Care® DHMO 09 Series of patient charge schedules (PCSs) includes many features and options from which to choose. This series provides a spectrum of schedules with multiple copay structures, so we can design the plan that meets our clients’ needs. Below is a summary of new features and enhancements that only apply to the 09 Series of schedules: • Surgical Placement of Implant Coverage – We are one of the few DHMO carriers to offer coverage for surgical placement of implants and related procedures such as sinus augmentation, bone grafting, and cone beam CT x-rays. • Same Day, In office Services – Members are able to take advantage of upgrading certain procedures which require material fabrications (veneers, crowns, inlays, onlays, and post and core) to same-day, in office service using CAD/CAM technology for a fixed copay. • Temporomandibular Joint (TMJ) Coverage – TMJ coverage is now standard on our plans and coverages, and includes an exam, diagnostic cone beam CT x-ray, and an orthotic occlusal devise to treat TMJ. • Expanded Periodontal Maintenance Coverage – We have expanded coverage for periodontal maintenance cleanings to four per year to increase our focus on prevention. Additional Application of Fluoride and Fluoride with Varnish – At a minimal copay, we now allow additional applications of fluoride for those members who may need them. Delta Dental: Most mid- to large-range plans offered by Delta Dental are customizable within basic parameters, and we incorporate changes in treatment standards and technology as they evolve. Dental Health Services: Yes. Dental Health Services’ plans are better than previous incarnations. The company frequently performs comprehensive evaluations of its plans to ensure covered benefits, monthly premium rates, and copayments for services are appropriate and competitive. Guardian: The key is flexibility, especially in today’s market as employers and employees are trying to balance costs with benefits. Guardian offers customized options to fit each employer’s needs and budget. Our recent focus has been on innovative plan designs with flexible solutions, options like Guardian FreedomSM, which is a new lower cost dental option that gives members a choice of networks with access to providers in Guardian’s premier PPO network, DentalGuard Preferred, or in Guardian’s DentalGuard Alliance PPO, which offers even greater claims savings through a select pool of dentists. We also are focusing heavily on developing more voluntary options, a market we see poised for tremendous growth particularly with the legislative changes on the horizon. Health Net Dental: Health Net offers DPPO plans for small and mid-market groups. All of our DPPO plans include extra services for pregnant women in their second and third trimesters, including extra cleanings, scaling and debridement covered at 100% in and out of network and not subject to the plan’s deductible. Our Mid Market Classic Plus DPPO Plans include MaxAdvantage, our rewards program that allows members to carry over a portion of their calendar year maximum into the next calendar year. Our Basic DPPO is a unique plan offering in- and out-of-network coverage for preventive, diagnostic and restorative procedures (oral surgery, endodontics, periodontics, major services and orthodontia not covered). Principal Financial Group: Our current plan offers significant flexibility in plan design, optional coverage for cosmetic services, TMJ treatment, dental implant coverage, accident coverage, employee choice options and multiple price points. Employers can design any combination of plan options to meet their needs. In addition to our Maximum Accumulation feature which allows members to carry over a portion of their unused annual maximum for use in future years, we also have a Preventive Passport feature. This feature allows for preventive charges to not accumulate towards the annual maximum. Securian Dental: Yes, we have added greater flexibility. United Concordia: In recent years we have done the following: • Introduced more voluntary plan options and added optional coverage for posterior composite restorations and implants to clients with 10 or more enrollees. • We launched Preventive Incentive, which covers diagnostic and preventive services without counting them toward the member’s annual maximum. • Enhanced our employee oral health educational offerings. • Launched a series of plan designs through iDental, our dental product for individuals and families without coverage elsewhere. • New for 2014, we are introducing a value suite of products to include lower premium options, greater discounts on non-covered services and a lean product option. • Launched a dental discount program for Individuals through DentalPlans.com. • Introduced the UCWellness Oral Health Rider in 2012, which offers enhanced coverage for members with diabetes and other diseases to clear away concerns they may have on the cost of treatment. UCWellness also provides oral health education and program details for all members and targeted messaging to motivate those eligible for UCWellness benefits. Aetna: New DMO fixed co-pay plans that cover Implants were added. Aflac: Along with an increased policy year maximum, Aflac Dental continues to provide a simple, no direct-cost option for employers to enhance employee benefits offerings. The Aflac Dental plan provides the ease of administration without the hassle of network restrictions, deductibles, precertification for treatment, or annual premium reviews. Ameritas: Ameritas developed ACA-certified plans that are offered in most states. We also have developed our new Better Benefit product, through which certified pediatric dental benefits can be added to traditional dental plans. Pediatric dental claims are processed through both their traditional plan design and the ACA-certified design, and Ameritas pays the better of the two..
Anthem Blue Cross: We revised our Dental Net DHMO. Our new Dental Net DHMO plans cover approximately 300 procedures — approximately 62 percent more procedures than our existing Dental Net plans. In addition, our Dental Net network includes more than 8,000 general dentist and specialist access points in California. And, we still have our Dental Prime and Dental Complete products, which include modernized benefit designs, lower premiums, and a more robust dentist network locally and nationally.These plans include benefits, such as dental implants, annual maximum carryover and composite fillings on all teeth. Plus, there are more options for out-of-network reimbursement, including the 90th percentile of FAIR Health. Voluntary plans are available with a minimum of five enrolled employees. BEN-E-LECT: BEN-E-LECT has evaluated its Freedom PPO benefits portfolio and narrowed it down to four plans that have proven to be most beneficial to its members. By focusing on development of those four plans, BEN-E-LECT is now more able to create sustainable rates for its groups taking into account size and location. BEN-E-LECT has also eliminated the waiting period for groups and new hires on its employer-paid plans for added convenience. We have also added an EPO option to our portfolio which allows for even more cost savings and offers one of the strongest networks available. BEST Life: Beginning in 2015 we will offer certified-pediatric plans that meet or exceed ACA standards to complement our product offerings. So the great Dental solutions from BEST Life continue to meet the changing needs of our groups in California. Blue Shield: For 2014, we are introducing two new dental PPO plans in our small group portfolio designed to fill a gap in the upper end of the benefit spectrum. • organ transplants The program also provides 100 percent reimbursement of copays and coinsurance on certain dental procedures associated with treating gum disease. In April of 2014 we enhanced our customer experience with this program. Previously, customers submitted a reimbursement form each time an eligible service was performed. Now, customers only need to register once (for each eligible condition) and their coinsurance/copays for qualifying procedures will automatically be reimbursed within 2-3 weeks from when we receive the claim from their dentist. We have made several enhancements to our DPPO products to provide additional benefit flexibility including cost saving capabilities with our dental code classification process thru improved class shifting functionality. Delta Dental: To help make dental plan administration even easier for our network fee-for-service dentists, Delta Dental launched new online Provider Tools — a suite of helpful services that enables real-time processing of certain claims and pre-treatment estimates (those that don’t require clinical review, for example). With real-time processing, dentists and patients can see the patient’s payment portion and what Delta Dental will pay within moments. Provider Tools also gives dental offices other useful features, including a list of their Delta Dental patients and eligibility and benefits details, access to the status of submitted claims, a reference library, a list of Delta Dental’s payments and more. Provider Tools are fast, friendly, free — and an easy way to reduce paper use, too. In addition, Delta Dental recently introduced a new online health risk assessment tool that provides a structured set of questions that produces a risk assessment score that identifies specific issues related to the individual’s oral health. The tool’s risk assessment form is meant not only to inform the respondent as to likely risks of oral disease, but also to serve as a discussion piece with the individual’s dentist. The risk assessment form can be printed and shared with the patient’s dentist at their next appointment. The intent of this risk assessment tool is to inform the patient and their dentist of specific risk factors for oral disease and help guide preventive measures. Dental Health Services: Dental Health Services now offers dental implants as a covered benefit. Specialized crowns and upgrades are also now available. Guardian: Guardian constantly develops new, innovative ideas in order to meet our customers’ needs by helping keep their teeth healthy and saving them money. Guardian Freedom allows members to choose between networks, and members are still free to see out-of-network dentists. We also offer dental benefits through the California state exchange. Members can easily access an electronic ID card or find a dentist near them (in English or Spanish) at www.GuardianAnytime.com or on their smart phones with GuardianAnytimeSM Mobile. Health Net Dental: All of our Classic Plus, Classic, Essential and Basic DPPO plans include extra benefits for pregnant members in their second and third trimesters. HumanaDental: Plans in our new generation of products are available as voluntary plans, and to groups with as few as two employees. Our new plans offer an extended maximum benefit, in which members get 30% coinsurance on services rendered after they reach their annual maximum (implants and orthodontia excluded). In addition, no waiting periods for major services for voluntary groups with 10 or more enrolled, open enrollment options, and orthodontia benefits. Updates include reimbursement options for out-of- network reimbursement: maximum allowable fee, or based on in-network fee schedules. Additional deductible choices, implant coverage, and acrylic filling coverage have also been added. Due to the connection between oral health and overall health, we have added, free of charge, oral cancer screenings to all of our products, excluding DHMO/prepaid plans. Principal Financial Group: Our current plan offers significant flexibility in plan design, optional coverage for cosmetic services, TMJ treatment, dental implant coverage, accident coverage, employee choice options and multiple price points. Employers can design any combination of plan options to meet their needs. In addition to our Maximum Accumulation feature which allows members to carry over a portion of their unused annual maximum for use in future years, we also have a Preventive Passport feature. Securian Dental: Enhanced benefit plans. Escalating Annual Maximum and Lifetime Deductible options where available. United Concordia: In recent years we have done the following: •Expanded our PPO network by 12,000 dentists, to create our Alliance network. ?? not exactly sure of the final #s, but something to this effect. • We re-credentialed our PPO network of dentists, and now more than 8X% accept our discounted allowances for non-covered services and services over the annual maximum. Members can find which dentists have agreed to this cost saving measure, by looking at our website. The dentists are clearly noted. • We launched Preventive Incentive®, which covers diagnostic and preventive services without counting them toward the member’s annual maximum. • Enhanced our employee oral health educational offerings. • Introduced Smile for Health – Wellness®, which offers enhanced coverage for members with diabetes and other diseases to clear away concerns they may have on the cost of treatment. This coverage is now standard with all plans. Smile for Health – Wellness also provides oral health education and program details for all members and targeted messaging to motivate those eligible for Smile for Health – Wellness benefits. Aetna: PPO — We offer a national network of dentists. Each covered family member can visit any licensed dentist for covered services. When members visit dentists who participate in our network, their out-of-pocket costs are generally lower. Aetna: DMO — Members must seek care from a participating DMO provider unless a state allows a member to seek out of network care. We make this easy by consistently offering the largest DMO network in the industry. Anthem Blue Cross: Members of our Dental PPO plans, including Dental Prime and Dental Complete, can see any dentist they want. However, members who choose a network provider generally experience lower out-of-pocket costs. Plus, members never need to file a claim when they see one of our in-network ­providers — the dentist files the claim for them. The DHMO plans are in-network only. Aflac: Policyholders may use any dentist they choose since Aflac Dental does not have network requirements. BEN-E-LECT: Yes, BEN-E-LECT’s plans offer in and out-of-network coverage with multiple options for coverage and benefits. The members maintain complete control over the dentist they choose to utilize. BEST Life: Yes, group and individual products allow members to visit any dentist of their choice and receive coverage for services. Blue Shield: Yes, dental PPO plan members can choose to go to any dentist, although their benefits will be covered at a higher percentage when choosing a network dentist, with less out-of-pocket expense. Cigna: Insureds can use their own dentist in the DPPO and dental indemnity plans. However, there are no out-of-network benefits with DHMO, CignaPlus Savings dental discount plans (not insurance) or with DEPO. Individuals can nominate their dentist to join our plan and if the dentist wants to participate and meets our criteria, he/she will be credentialed and added to the network. Additionally, DPPO and DEPO plans may include savings on most non-covered services (in states where allowed by law). Most of our DPPO network dentists offer their negotiated contracted fees to customers and their covered dependents for most non-covered services (in states where allowed by law). And the savings also apply to covered services when an individual exceeds his or her annual maximum or other plan limitations, such as frequency, age or missing tooth. We are continuously expanding our network to meet the needs of current and potential clients. Delta Dental: Delta Dental Premier enrollees can visit any licensed dentist for care, although there are advantages to visiting one of more than 48,000 dentist locations for Delta Dental Premier dentists in California. Enrollees can go to any dentist, but they are only guaranteed to get in-network benefits and avoid balance billing when visiting a Delta Dental dentist. Delta Dental PPO enrollees also have freedom of choice, but can benefit from the protections associated with selecting one of more than 31,000 dentist locations for Delta Dental PPO dentists in California. PPO enrollees have access to Delta Dental PPO and Premier dentist networks with different levels of savings. DHMO enrollees must use a participating general dentist or approved specialist, except for emergency care. There are more than 5,100 dentist facilities for DeltaCare USA in California. Guardian: Members covered under our PPO plans can visit any dentist; however, benefits may be paid at a lower coinsurance rate for non-participating dentists. DHMO members must choose a participating primary care dentist. HumanaDental: PPO members can visit the dentists of their choice. Out-of-pocket savings are greater when members visit participating network dentists. Principal Financial Group: Yes, our members can see any dentist even if the dentist is not on the “participation” list if they are enrolled in either our PPO or POS design. If a member is enrolled in our EPO design, network dentists must be seen for services in order to receive benefits under the plan. United Concordia: Our FFS and PPO plans allow members to visit any dentist. However, out-of-pocket costs are lower when visiting a participating network provider. DHMO members must use network dentists. 6. If the dentist bill exceeds U&C, can the dentist bill the patient for the difference? Aetna: For covered services, network dentists are contractually prevented from balance billing above the negotiated rate. Non-covered services are also available for a discount in some states. Dentists who are not in our networks may balance bill members. Aflac: Aflac Dental pays benefits based on a Table of Allowances and not on UCR. If the dentist’s charge exceeds the benefit amount paid, the dentist may bill the patient for the remaining balance. Ameritas: Ameritas PPO/First Dental Health (FDH) Networks — Ameritas PPO dentists and FDH PPO dentists are bound by contract not to balance bill the difference between their normal charge and PPO maximum allowable charges. Anthem Blue Cross: No, not when visiting an in-network dentist with our PPO plans, including Dental Prime and Dental Complete. Anthem Blue Cross participating provider contracts include negotiated fee agreements that prohibit balance billing. A participating dentist may not balance-bill members for amounts that exceed the negotiated and contractually agreed on fee. Members are not responsible for amounts in excess of negotiated rates. However, if a member visits an out-of-network provider, there is no contract and the provider can bill the patient for the difference. With our DHMO plans, the patient is only responsible for co-payments and non-covered services when accessing services through their participating dental provider. BEN-E-LECT: The member does have the option to choose this method upon enrollment. BEST Life: Members will not be balanced billed if they receive treatment from a contracted PPO provider. All our dental PPO plans offer a regional and national PPO network. Members can access their in-network benefits anywhere in the country and will not be balance billed. Blue Shield: No, in-network providers cannot bill members for fees that exceed the negotiated rate. Non-network providers, however, may bill for charges that exceed the plan’s allowed amount. BRIGHTER: Not if the dentist is participating on our platform. Cigna: DHMO. Network general dentist and specialist contracts contain clauses that prohibit dentists from charging members any additional fee, surcharge, or other cost for services, other than applicable patient charges as defined in the patient charge schedule (PCS) or contract payment schedule for covered procedures. For services we do not cover, dentists may charge their usual fees. For certain orthodontic procedures, network dentists may charge incremental costs associated with optional/elective materials, including, but not limited to ceramic, clear, lingual brackets, or other cosmetic appliances. DEPO/DPPO. Cigna’s network dentists’ contracts include language to ensure that members are only charged in accordance with the contracted fee schedule amounts. They are prohibited from balance billing members. Network fee schedules apply for covered services even after members have reached their annual maximums or exceeded frequency limitations, or if the applicable dental plan imposes missing tooth limitations or other similar limitations. For noncovered services, members are responsible for paying the dentist’s usual fee or contracted fee for that procedure. Since the DEPO plan does not cover out-of-network services, members are responsible for the out-of-network dentist’s usual fees for any treatment received out-of-network. Out-of-network dentists may balance bill the difference between the DPPO plan’s payment and their usual charges. Indemnity. We do not prohibit balance billing for our traditional indemnity plan coverage; dentists may balance bill the difference between the plan’s payment and their usual charges. Members pay dentists at the time services are rendered and then submit claim forms to us, or dentists submit the claim forms directly to us for payment. Delta Dental: Contracted dentists agree not to balance bill patients for services covered under the program for which the dentist has contracted service fees. Delta Dental holds its Delta Dental PPO and Premier dentists to their contracted fees when providing services to eligible enrollees. DHMO enrollees do not pay more than their set copayment for covered benefits under the DeltaCare USA plan. Specialists are paid the difference for charges exceeding the enrollee’s copayment for all preauthorized services. When an enrollee chooses a more costly procedure not covered under the plan, the enrollee is responsible for the difference in cost between the network dentist’s usual fees for the covered procedure and the optional treatment, plus applicable copayment for the covered procedure. Dental Health Services: No. Dental Health Services guards against balance billing for specialty claims and also has separate safeguards in place to protect your clients’ members from other types of overcharging. Dental Health Services contracts with participating specialists who specifically prohibit balance billing. The specialist can only charge the agreed-upon fee for a particular service. This and other proactive initiatives designed to advocate for members have resulted in Dental Health Services’ 97% retention for satisfied group clients and their members. HumanaDental: Members are encouraged to visit in-network providers to experience lower out-of-pocket costs. In-network providers have agreed to accept the amount listed on their PPO fee schedule as payment in full, less all copayments, coinsurance, deductibles and non-covered services. They may not balance bill for amounts that exceed their PPO fee schedule. Out-of-network members are responsible for any charges that exceed the maximum amount that Humana will reimburse for a specific service. Principal Financial Group: Dentists cannot bill over the UCR/fee schedule allowance amount if they are part of our PPO or EPO networks. If the dentist is not a part of one of our networks, he/she can bill the amount over UCR. United Concordia: Contractually, United Concordia participating dentists agree to accept our allowances as payment in full for covered services (less any deductibles and coinsurances or co-payments). Western Dental: Since this is a managed care plan, members pay only the applicable co-payment listed on their benefit schedule. Members are financially responsible for non-covered procedures at a discount. Aetna: Our explanation of benefits shows the member’s out of-pocket responsibility. Additionally, the vast majority of our network dentists accept the contracted amount for non-covered services and any services over the annual maximum a copy is sent to member and provider. If necessary, the provider relations area helps resolve any issues whether related to over billing, waiver of co-payments, or other issues. Aflac: Aflac Dental does not have network requirements. If the dentist’s charge exceeds the benefit amount paid, the dentist may bill the patient for the remaining balance. Ameritas: The explanation of benefits automatically calculates the insured’s portion of the bill to prevent these kinds of problems. Anthem Blue Cross: With our Dental Prime and Dental Complete plans, we protect members against inappropriate billing through our provider contracts, claim review, and our continuous analytic monitoring of the treatment and claim submission patterns of each dentist that submits claims to us. For our DHMO programs, our quality assurance teams assess claims and providers regularly to ensure our DHMO members are getting the highest level of service and satisfaction. BENELECT: Provider network discounts are applied automatically when a claim is submitted. We also make pre-determination services available to inform members what their charges will be prior to receiving service. The members also receive an explanation of benefits which clearly illustrates network savings and patient responsibility. BEST Life: We do this in several ways: 1) Provider network discounts are applied at the time a claim is processed; 2) Predetermination services are available to inform members what their charges will be prior to receiving service, 3) We provide easy-to-understand EOBs that clearly illustrate network savings. 4) We have educational flyers that inform members on how their dental plan works and why they should go to a network provider. Blue Shield: We prohibit network dentists from balance billing a member for the difference between billed amount and the amount received. Members are only charged the applicable copayment or coinsurance. We monitor and address any network dentist who attempts to bill for this difference. BRIGHTER: We track all utilization of the plan to ensure both the members and sponsor are billed appropriately. Cigna: Balance billing for covered procedures is strictly prohibited. We counsel network dentists who do not comply. Continued balance billing may be referred to our Credentialing Committee for review of future participation in the network. Cigna monitors allegations of overcharging through enrollee feedback, surveys, and the dental network management staff. For DHMO plans, the collection of copays is between the patient and the dentist. We encourage dentists to collect copays at the time treatment is rendered. For DPPO/Indemnity plans, it is illegal in some states for dentists to routinely waive deductibles. Since our group contracts indicate that Cigna is not responsible for any charge the patient is not required to pay, we may reduce our claim payment by the copay amount waived by the dentist. Our Special Investigations Unit may also contact the dentist and the patient for further information and has the ability to review claims on an ongoing basis. Delta Dental: Delta Dental Premier and PPO dentists contract with us to establish acceptable fees as well as formally agree to certain protections for Delta Dental enrollees. Protections include no balance billing — contracted dentists cannot charge enrollees for the difference between their contracted Delta Dental fee and their submitted charge for a service, and they may only collect the patient portion (copayment plus any deductible and/or amount over the annual maximum) at the time of service. Delta Dental dentists also agree not to unbundle a procedure that is on file with Delta Dental as one procedure. Waiver of plan copayments and deductibles is considered fraudulent and is handled by notifying the dentist of the violation and possible network termination. DHMO network dentists agree to be paid by Delta Dental on a guaranteed capitation basis. They also contractually agree to accept enrollee copayments as payment in full for covered dental procedures and not to seek additional fees. If a dentist consistently demonstrates a disregard for their contractual obligations with Delta Dental, their participation may be restricted or terminated. Dental Health Services: Dental Health Services’ Professional Services Staff regularly audits the company’s participating dentists’ charts on-site to ensure dental care and treatment provided to members meet the company’s quality standards and policies. In addition, plan members receive extensive patient education and tools to help them understand their plan benefits so they can question charges that may not be in compliance with plan benefits. Members are encouraged to contact the plan for assistance if they feel they are being overcharged. Guardian: Guardian’s PPO dentists may only charge members for any covered charges other than the deductible or coinsurance that may apply to the discounted fee schedule amount. Explanation of benefits statements sent to members specifically identifies the discounts taken and the member’s responsibility. Health Net Dental: Under our DPPO and DHMO plans, participating dentists are contractually prohibited from balance billing a member more than the maximum allowable charge or the contracted copayment amount. Practices are in place to discipline network dentists who attempt to bill members more than these contracted amounts. If it is determined that a participating dentist has overcharged a member, our Customer Service team will contact the provider on behalf of the member to confirm benefits and re-educate the office about proper plan collection from a member. If the provider refuses to comply with the plan design, the issue is escalated to the Professional Relations Department for follow-up with the provider. Depending on the circumstances, the issue could be escalated to our Quality Management Team, which follows state mandates for a full investigation, including the request for patient records from the office and a review by a dental professional. These investigations must be completed within 30 days and written communications are sent to the member and provider. If the provider still refuses to comply, our legal department would be contacted and steps may be taken to terminate our relationship with the provider. In these rare instances, it might become necessary for the plan to reimburse the member or provider depending on the circumstances and to ensure a positive member experience. HumanaDental: The dentist and the patient get an explanation of benefits to ensure that the dentist does not overcharge or omit fees. The claims processing systems adjudicate the claim based on the contracted fee schedule. Waiving co-payments does not apply under a PPO. Principal Financial Group: Provider utilization patterns are studied and issues are addressed as uncovered. United Concordia: United Concordia participating dentists contractually agree to only bill members for applicable deductibles, coinsurance, or amounts exceeding the plan maximums. In addition, members receive explanations of benefits that clearly describe the services received and their financial responsibility. Members can also access the My Dental Benefits tool on our website (UnitedConcordia.com) to view their benefits and eligibility information, claim details, procedure history, maximum and deductible accumulations and more. Plus, United Concordia’s responsive customer service representatives are available to assist members with questions regarding their benefits. Our Utilization Review area also analyzes thousands of claims each year to ensure the acceptability of treatment and quality of services. Our dental advisors and consultants also continuously review dentists’ fees and practice patterns for statistical variation from their peers. Dentists who fall outside of the norm are targeted for education and additional monitoring. Western Dental: Providers are bound by contract to accept the member’s schedule of benefits. Members can also access the My Dental Benefits tool on our website (www.UnitedConcordia.com) to view their benefits and eligibility information, claim details, procedure history, maximum and deductible accumulations, and more. Plus, United Concordia’s responsive customer service representatives are available to assist members with questions regarding their benefits. Our Utilization Review area also analyzes thousands of claims each year to ensure the acceptability of treatment and quality of services. Our Dental Advisors and consultants also continuously review dentists’ fees and practice patterns for statistical variation from their peers. Dentists who fall outside of the norm are targeted for education and additional monitoring. Aetna: As of 6/1/14: DMO over 11,000 dentist locations nationally and 98,000 in California, PPO: over 225,000 dentist locations nationally and 37,000 in California. Aflac: Aflac Dental does not have network requirements. Policyholders may visit any provider they choose. Anthem Blue Cross: We’ve had a lot of growth in our dental networks the last couple of years. Dental Complete members have access to more than 16,600 unique dentists and nearly 40,000 access points in California alone — and more than 96,000 unique dentists and 228,100 access points nationwide. That’s 75% more dentists nationwide than we had in 2011. Our Dental Net DHMO network includes nearly 10,000 provider locations in California to choose from. Additionally, all Anthem dental members have access to our international emergency dentist network, with 24/7 assistance with locating an English-speaking provider for dental emergencies in approximately 100 countries worldwide. Services received through this program do not count toward the member’s annual maximum if their plan has one. BEN-E-LECT: BEN-E-LECT’s dental plans utilize the Health Smart (Interplan), First Dental Health, Dentemax, PPO USA and Western Dental networks, which contain thousands of offices statewide. BEST Life: We offer access to a regional and a national PPO networks — First Dental Health (FDH) and DenteMax. Our California network has over 68,672 access points and an additional 9,593 provider locations throughout the state. Our national network has over 285,000 provider locations, which offers our members network access when they are outside of California. Blue Shield: Members have network access to over 16,000 dental HMO and 25,000 dental PPO providers in California, and more than 218,000 providers nationwide. These are two of the largest statewide provider networks in the industry. BRIGHTER: While Brighter can be used at any dentist, with discounts at over 190,000 Access Points nationwide, it currently is only available to employers with a significant portion of their employees located in Southern California as that is where we deliver the greatest savings and member experience. Cigna: Across all specialties, Cigna has over 131,300 unique DPPO dentists nationally and over 20,500 in California. For DHMO, Cigna offers access to 19,200 offices across the country, with 5,020 DHMO offices in California. Delta Dental: Our networks offer access to more than 48,000 dentist locations for Delta Dental Premier, more than 31,000 dentist locations for Delta Dental PPO and more than 5,100 dentist facilities for DeltaCare USA in California. Dental Health Services: Dental Health Services’ exclusive, Quality Assured dental network consists of 927 general practice offices with 4,354 participating dentists and an additional 1,924 specialists. Guardian: There are over 244,321 PPO dentist locations across the country and more than 34,882 in California. We are one of the largest PPO networks in the state based on unique dentists. The DentalGuard Alliance PPO network has over 5,803 dentist-locations in California. For the DHMO, there are 14,367 locations across the country and 7,093 in California. Guardian’s PPO network now includes more than 56 dental offices in Mexico. International Assist, a value-added service available, provides dental members with access to dental care if needed while traveling outside of the U.S. Also, a supplemental listing of out-of-network dentists, Out-of-Network Plus, provides Guardian members greater selection in finding an affordable dentist. Health Net Dental: As of May 2014, our California PPO network includes 40,722 access points in 11,367 locations. Our California DHMO network includes 2,382 locations. HUMANA Dental: Nationally, Humana has more than 215,000 provider locations. In California, we have approximately 30,000 provider locations. Principal Financial Group: We have approximately 48,000 PPO provider locations and 25,700 EPO provider locations. Securian Dental: More than 190,000 dentist access points. United Concordia: To support our diverse product portfolio consisting of fee-for-service, DHMOs and PPOs, we maintain some of the largest dentist networks in the nation. Our largest network provides access to 92,500 dentists at almost 235,000 access points. In California alone, we have 15,800 providers at 37,833 access points. Our DHMO network includes more than 2,600 primary dental offices and almost 1,700 specialists nationwide, with over 1,657 primary dental offices and 776 specialists in California. Ameritas: Ameritas PPO and the FDH Networks – Insureds can choose any provider at any time for procedures. Anthem Blue Cross: Yes. Our PPO networks, including Dental Prime and Dental Complete, are open-access models: The member does not have to pre-select a dentist and can always see the dentist of his/her choice. DHMO members can change providers once a month. BEN-E-LECT: Yes. Members may change providers at any time by selecting to use another provider. No further documentation or process is necessary. BEST Life: Members may choose any dentist they desire without calling BEST Life to switch providers. We also provide immediate access to customer service, who can assist members with selecting a provider. Blue Shield: Yes. Dental PPO plan members have the flexibility to see in-network or non-network providers while dental INO members can only see network providers. However, dental PPO and dental INO plan members may change providers at any time without notice; Dental HMO plan members may change their primary care dentist as needed; changes will be effective the first of the following month. BRIGHTER: Brighter members can choose the best dentist that matches their needs. Using our online dental shopping platform, members choose dentists based on location, ratings or price. Cigna: DHMO – Members may transfer to a new dental office once a month and for any reason, as long as the member has paid his/her account, in full, at the current office. Members can call our customer service department to speak with a representative, transfer using the online Dental HealthCare Professional Directory on myCigna.com or use our automated transfer option which can process transfers 24 hours a day. Transfers are effective the first of the following month. We suggest that members complete any dental treatment-in-progress before transferring to another dental office. DPPO — Cigna DPPO members have the freedom to visit either a network dentist or any licensed dentist at any time. However, we do recommend that they complete any treatment-in-progress and pay outstanding balances full before changing dentists. DEPO — Cigna DEPO members may seek care from any ­network dentist; however, we do recommend that they complete any treatment-in-progress and pay outstanding balances in full before changing dentists. Indemnity Cigna Traditional indemnity members have the freedom to visit any licensed dentist at any time. Dental Health Services: Yes. Member satisfaction is Dental Health Services’ top priority, which is why members can change their dentist at any time by contacting their Member Service Specialist or by simply visiting the Dental Health Services website at www.dentalhealthservices.com. Guardian: Members covered under Guardian’s PPO plans can change dentists at will, regardless of whether the dentists are participating or non-participating. Members covered under our DHMO plan may change dentists by using our on-line web tool, GuardianAnytime.com, or by calling our toll-fee number. We also offer a dual choice monthly switch plan which enables members to switch between the DHMO and PPO as often as desired on a monthly basis. United Concordia: Yes, members can change PPO providers at any time without notice. DHMO participants may change dentists by writing or calling our customer service department and requesting a new DHMO provider, as long as there is no existing balance due to the current dentist or treatment in progress. 10. How do you ensure that your dentists are aware of the benefits of your plan(s)? Do you have a way of knowing if the dentists are soliciting or recommending services that are not compensated for by your plan? Aetna: Participating dental offices receive our helpful Dental Office Guide, which provides clear information about plan designs, policies, and procedures. We also offer a website specifically designed for dentists. The site includes real-time eligibility and benefits information, a 24/7 speech recognition system called “Aetna Voice Advantage.” Also, our dental solutions team is trained to know what is important for provider service. Unusual treatment patterns may be discovered during our review of utilization reports. This usually results in an office audit that includes a review of patient files and general office practices. We talk with the dentist about the findings and develop recommendations for improvement where needed. Aflac: Aflac has materials that may be provided to dentists with information on how to file claims and access online materials. A dedicated section on aflac.com provides dentists with claim forms and instructions, as well as online access to verify policy benefit amounts. If the dentist has any additional questions, he or she may call Aflac’s Customer Service Center toll-free -1.800.99.AFLAC. Ameritas: Providers can access individual plan information using the toll-free voice response system, the fax-back system, or our online benefit Website. We hope this educates both the provider and insured about covered benefits. If not, periodic surveys and automated utilization review mechanisms help provide a way to monitor issues regarding plan coverage misunderstandings. Anthem Blue Cross: We inform participating dentists of plan benefits through a variety of communication vehicles. Dentists can access updated information on our Website, through our interactive voice response system, directly from our provider relations and customer service representatives, and through our provider mailings. Practice patterns of participating providers are monitored continuously and reported through monthly utilization reports and claims experience. We involve our dental director when we suspect over- or under-utilization patterns. In such cases, our dental director contacts the dentist to discuss findings along with a plan of action to help bring the practice within the standard. BEN-E-LECT: The members are given material specific to the dentist to ensure benefits are understood. BEN-E-LECT also offers extended customer service hours with a department dedicated to assisting dentists with benefits information. BEN-E-LECT also has regular outside auditors review claims for this information in addition to scrub during time of payment. BEST Life: Dentists may contact BEST Life for information about member benefits by calling 800-433-0088. All calls are answered by a live person, every time, no exception. We also have a fax back line dentists can use to obtain benefit information. Blue Shield: We strive to make it easier for dentists to participate in our network by automating as many administrative processes as possible. Because administrative capabilities vary among dental offices, multiple approaches exist to facilitate dentist communication-from web-based applications to direct telephone contact-to ensure that all offices have access to critical dentist information and support. Communication channels available 24 hours a day, seven days a week, include: • The Interactive Voice Response (IVR) system offers real-time eligibility verification and claims status inquiry. The IVR also provides fax-back capability for hard copy eligibility verification. • A website enables eligibility verification, benefit confirmation and claims status inquiry. • Electronic Claims Filing — we contract with a number of clearinghouses or trading partners to receive electronic claims submissions. • Electronic Claims Payment — The capability exists to pay our providers electronically if they so choose. Claims are paid on a daily basis (Sunday-Friday). Network dentists can control costs and increase efficiency by submitting data electronically, using our website and interactive voice response (IVR) system. BRIGHTER: Our dentists utilize our simple online platform to process interactions with our members so mistakes are minimized. This also empowers us to track all recommended treatments and proactively remove providers that are over-utilizing (recommending unecessary services) from being seen by our members. Cigna: Our Internet-based platform allows contracted dentists the ability to conduct transactions over a secure website directly linked to Cigna. This website provides one-stop online access to information that the dental offices will find helpful to manage day-to-day operations and increase operational efficiency. Our website at www.cigna.com also provides an easy way for dental offices to access information about participating in the Cigna Dental Care or Cigna DEPO/DPPO network. The network management staff communicates regularly with dental office personnel by phone, periodic newsletters, site visits to provide information about regulations, practice management, patient satisfaction, policies, procedures, and high level news about Cigna. DHMO –The Cigna Dental Care Reference Guide, Patient Charge Schedules (PCSs) at a Glance and Specialty Referral Guidelines are provided to each network dental office on the plan. We produce a periodic newsletter to communicate information about regulations that affect dentists, nationwide and state-specific policies, procedures. This bulletin is mailed with monthly payment packages to the dental offices to which the information is applicable. DEPO/DPPO – The Cigna DPPO Office Reference Guide and fee schedules are provided to each network dental office on the plan. These documents describe the policies and procedures to administer the plan, assist members; contracted fee schedules for the dental office and the advantage of participating in the Cigna DEPO/DPPO network. In addition to the savings generated by our thorough and efficient claims and treatment plan review process, another key aspect of the utilization management program is the analysis of network dentist practice patterns (dentist profiling). Our utilization database containing millions of claims and encounters from more than 140,000 dentists across the country provides us with a comprehensive and statistically sound basis for establishing utilization norms. DHMO – When a dentist submits an encounter form, we enter and store in our database. We generate a statistical report monthly for each network dental office. This report provides a means to systematically evaluate each facility by presenting a clear profile of our dentists’ practice patterns. The report also includes state and regional normative data to facilitate the identification of outliers for each listed category, as well as the development of appropriate follow-up action plans. Based on the evaluation of the outliers by our dental directors, we initiate corrective action activity. If unacceptable practice patterns continue, we may end the network dental office contract. DPPO/DEPO – Cigna Dental uses our provider profiling application as part of our utilization review program. The application uses claims data to generate a report showing the practice profile for a given provider that can be compared with the average practice profile of his or her peers. The profiling report provides details on the following types of practice patterns: The database for any given period compares a single dental office with submitted procedures of over 400 American Dental Association (ADA) codes, with a frequency total of tens of millions of procedures. action. Through our utilization review and dentist profiling efforts, as part of our overall utilization management program, Cigna has been able to ensure network dentists provide adequate and appropriate care. Plus, we have saved our clients billions in the process. .
Delta Dental: Detailed program information for all enrollees, including maximums, deductible and benefit levels, is available through a secure area of our website and through a toll-free telephone number. Additionally, Delta Dental issues a bimonthly newsletter to network dental offices, which covers Delta Dental policy, industry news, seminars, new Delta Dental clients, tips on submitting claims and other useful information. We issue a quarterly quality-related newsletter to participating dentists that provides useful information to help improve the quality and efficiency of the care they provide. In addition, Delta Dental holds regular seminars to keep dentists up to date. Regular enrollee surveys seek information on various quality issues, such as services rendered that are not covered by the program; services delivered as claimed; office cleanliness and appearance; and customer service. Dental Health Services: Dental Health Services regularly provides on-site training, auditing, and service visits for the company’s participating prepaid (D-HMO) dentists. Additionally, each dental office receives a manual that contains comprehensive information about Dental Health Services’ dental benefit plans. The company monitors all services and treatment received by its members through monthly utilization reports. Guardian: Dentists can access plan benefits online at www.GuardianAnytime.com or through their practice management system. All PPO dentists receive information about Guardian’s plans through local network recruiters as well as email newsletters or mailings of pertinent information. Our claim system tracks and monitors each dentist’s practice patterns for bundling, over-utilization, etc. We consult with dentists who are not meeting our expectations, and if they are unable to do so, we may discontinue their network participation. All offices that join our DHMO network receive an orientation that fully explains the plan. Additionally, our DHMO Regional Network Managers periodically visit the offices to review the plan. Dental Offices submit encounter data of services provided to DHMO members which is reviewed quarterly by our Quality Assurance Committee. Health Net Dental: We educate our providers about our administrative policies, including guidelines on appropriate care. Providers are encouraged to submit pre-treatment plans for review in order to learn what procedures would be covered under the member’s benefit plan and the level of reimbursement. In the process of reviewing pre-treatment estimates and in completed claims, we track and monitor each provider’s practice patterns. Providers with aberrant patterns receive focused review, including statistical analysis and record audits, which may result in appropriate corrective action plans. Our Professional Network Relations Reps meet with providers to counsel them and to answer any questions about planning care for members. Our Internet portals provide real-time information to providers and members on their benefits. HumanaDental: HumanaDental notifies dentists, according to their contract, of any new product 45 days in advance of introduction. Providers are encouraged to check eligibility and benefits prior to treatment. Through monitoring of member communications and through utilization review, we would become aware of any situation where a dentist may be recommending non-covered procedures on a routine basis. Principal Financial Group: We provide online, telephone and fax service options for providers to verify benefits and eligibility. We encourage pre-determinations to be performed for inlays, onlays, single crowns, prosthetics, periodontics and oral surgery. Securian Dental: Dentists can verify benefits by calling our toll-free customer service phone number or via our Web site. United Concordia: Dental offices can confirm benefit coverage information on our website via “My Patients’ Benefits,” through our telephone interactive voice response (IVR) system, or by speaking to a customer service representative. In some instances, we also inform dentists of important benefit changes through written communications, via our quarterly newsletter, through a stuffer included with dentist checks and/or with an automated telephone call. Dentists can also reference benefit information using our Dentist Reference Guide, available on our website. Professional relations representatives are also available to provide assistance when necessary. We identify abnormal practice patterns through a comprehensive quality assurance process. United Concordia reviews thousands of claims each year to ensure the acceptability of treatment and quality of services. Advisors and consultants also review dentists’ fees and practice patterns. Dentists who fall outside of the norm are targeted for education and additional monitoring. Western Dental: Each provider is trained and given training materials to ensure that they are knowledgeable about Western Dental programs. Western Dental Services also monitors customer service inquiries and grievances in addition to reviewing utilization data supplied by each provider. M&A transactions are on the rise, and with the higher volume of deals comes fresh awareness about some of the pitfalls. While sellers often provide accurate information in representations & warranties, mistakes can happen, and those mistakes can result in costly liabilities on both sides. That’s why representations & warranties insurance is so important. It protects against inaccuracies made by the seller or a target company in connection with a merger or acquisition. The coverage is an important tool to help close deals that might stall or even be cancelled because the seller and buyer can’t agree on indemnification terms. Both sellers and buyers can purchase this coverage quickly and efficiently to speed deal closures and avoid costly delays. • A draft purchase agreement. • Most recently audited/reviewed financials of your target. How Will Representations & Warranties Coverage Benefit Me? Representations and warranties insurance coverage can expedite closures on transactions, especially on transactions in which sale delays may be caused by the scope of the seller’s indemnification. You are covered for unknown breaches of representations and warranties after due diligence has been conducted. This insurance plays the role of a security behind a seller’s indemnity for breaches of representations and warranties. If you need to, it allows you to make a clean break from the deal without worrying about being subjected to indemnification claims after closing. You can also close deals with ease and confidence since the buyer and seller can get representation and warranties coverage. Representations and warranties coverage can also differentiate the buyer’s offer in a bidding situation. Sellers can target business to get more of the sale proceeds upfront. The coverage also lowers the post-closing indemnity obligation. In fact, such use of insurance could make it more likely that the buyer will win the auction. Sell-side coverage provides compensation for defense costs and losses when a buyer claims there was an inaccuracy or breach of the representations and warranties made by the seller. This coverage provides a security behind the seller’s indemnity. With a sell-side policy, the seller can walk away from a closed deal without worrying that subsequent legal claims will diminish the proceeds. With representations and warranties coverage a buyer or seller can improve their chances of closing the deal and realize other benefits as well. The examples below demonstrate scenarios in which this type of insurance can be useful. Two -parties have agreed to all aspects of a sale agreement, with one exception: the amount of indemnity supporting the representations and warranties. The buyer requires $25 million in indemnity while the seller can only commit to $10 million. A representations and warranties policy could be issued for $15 million, in excess of the $10 million agreed by the seller. With this coverage in place, the buyer would have the confidence necessary to proceed. A buyer requires a 36-month indemnity period to respond to breaches of the representations and warranties in the sale agreement. But the seller will only provide a 12-month indemnity. A representations and warranties policy could insure for breaches of representations and warranties made by the seller (when discovered after 12 months and prior to 36 months from the transaction close date). This gives the buyer assurance that the full 36-month term will be covered. All transaction terms have been agreed upon, including an indemnity of $10 million to support the representations and warranties in the sale agreement. The buyer requires the full amount of $10 million indemnity be held in escrow, but the seller will only commit $5 million of the sale proceeds to be held in escrow. To solve this issue, representations and warranties policy can be issued for $5 million in excess of the $5 million placed in escrow by the seller. Representations and warranties insurance coverage ensures that the buyer and seller are protected in a merger and acquisition transaction. For complete peace of mind, partner with an experienced insurance broker that is well versed in these kinds of situations and can help you facilitate full coverage and smooth transactions. Jen Scales is an assistant vice president in ABD Insurance & Financial Services’ Business Development group. With 10 years of experience as an Executive Liability Broker focusing on directors and officers coverage, Scales has extensive knowledge of insurance placement for professional liability. If you have a Swiss Army knife, you know how difficult it is to get along without it. It’s like having a whole toolbox in your pocket. It’s the same with Indexed universal life insurance (IUL) or equity-indexed universal life insurance (EIUL). This is a type of permanent life insurance that features all the benefits of the traditional universal life insurance, but with accrued values that are tied to a stock market index. This offers the policyholder the opportunity to reap the benefits of stock market gains while enjoying the protection of the policy’s guaranteed minimum interest rates should the stock market drop. IUL policies credit interest based partly on the upward movement of a major stock market index, so when the market does well, so does your client. Over the life of the policy, this could translate into higher cash value and additional supplemental retirement income. At the same time, the tax-deferred benefits of a traditional universal life policy still apply. However, IULs do have a cap rate, or maximum rate, which can limit the gains when compared to a variable policy that has no ceiling (or floor) whatsoever. IULs also give policyholders a guaranteed minimum interest rate, unlike variable life insurance or mutual funds. So while they’re taking advantage of the market going up, they’ll never suffer losses due to the market going down: Zero is a client’s hero! As a client’s needs change, the policy can change with them. With this flexibility, the death benefit can change; premiums can increase or decrease; and there are options or riders to meet particular needs. If a client is just starting out in life or working with a limited budget, an IUL policy can lay a solid foundation. Then, as a client enters new life stages, premium payments can be adjusted to help build more cash value for the future. For the older client who may have a larger amount of money available that is not needed for current income, there’s an option for making a single lump sum payment. Should the money be needed later, it’s still available. Indexed universal life insurance provides a tax-deferred way of accumulating a cash value at competitive interest rates. This can actually be a valuable alternative to a Roth IRA or 401K due to the potentially higher interest rates, tax efficient income to the policy owners, and the ability to withdraw loans from the policy for specific purposes such as education or emergencies, all while maintaining a death benefit. Unlike other retirement vehicles, there are no limitations on the amount that may be contributed annually to an IUL .As of 2013, the IRS limits the annual contribution to an IRA to $5,500 annually if the account owner is under 50 and $6,500 annually if the participant is 50 or older. IUL policies can help clients leave a legacy to pass on to their heirs by giving them as much of their estate as possible, while making sure the tax and other obligations are satisfied. It can be used to convert tax-heavy assets, such as IRAs and nonqualified annuities, in situations where a client’s original needs may have changed. According to The College Board’s 2011 Trends in College Pricing, over the decade from the 2001/2002 to 2011/2012, the published -tuition and fees for in-state public four-year colleges and universities grew at an average rate of 5.6% per year beyond the rate of inflation. Another key benefit of permanent life insurance, that doesn’t involve death, is it’s potential to accumulate cash value on a tax-deferred basis. Those funds can then be accessed to help pay for college costs, if necessary. Various loan options are available to help clients access the potential cash values within their policy. The death benefit gives clients peace of mind knowing that their loved ones will not face financial hardship in the event of their death. And the cash value can grow with their family and their needs. The income tax free proceeds can provide liquidity to help pay estate taxes and expenses. Under certain circumstances, those who would otherwise be uninsurable on a single life insurance policy, due to their health, can be covered with another individual under a survivorship policy. Survivorship policies can be a great tool for allowing grandparents to leave a legacy to their grandchildren. The policy’s proceeds can be paid to one or more charities or it can replace the amount gifted to a charitable organization in order to provide heirs with the full value of the estate. Survivorship life insurance has several business applications, from business succession plans to key person coverage. In addition, the benefits that apply to individuals also apply to business owners; however, if a client is an S corporation, there is the option of making the premium contributions as a draw against the profits of the corporation and avoid the self-employment tax/Social Security tax, which results in a 13.3% tax savings! Zachary G. Cole is an Associate Brokerage Manager at First American Insurance Underwriters, 460 Hillside Ave., Needham, MA, a national life brokerage firm specializing in coaching growth-oriented producers and providing them valuable solutions to their complex cases. He is a graduate of Rollins College with a B.A. in economics. He can be contacted at 800-444-8715 or zcole@faiu.com. Despite being one of the building blocks of a secure financial future, life insurance remains a mystery to many employees. Workers know that it offers valuable protection, but confusion and lack of understanding may be providing barriers to purchase. In fact, even though millions of Americans are living without the protection of life insurance, according to the LIMRA 2014 Insurance Barometer Study, nearly 80% of people believe that most people need it. This is unfortunate, because life insurance has evolved beyond a simple lump sum death benefit. New features, including grief counseling and face-to-face will preparation, offer employees meaningful benefits and services that address their needs and offer valuable protection. To help bridge this gap in understanding, employers should look at improving benefit communications and education, especially for the youngest members of the workforce — Gen Y — whose understanding of the product lags behind other generations. Educating employees about the features that life insurance offers beyond a simple death benefit will not only help them provide security for their family, but it can also help employers create a productive and loyal workforce. According to MetLife research conducted in 2013, Gen Y workers lag behind older generations when it comes to life insurance ownership with only 54% owning this protection, compared to 64% of Gen X employees and 71% of Boomers. This may be tied to their limited understanding of this product. In fact, six in 10 Gen Y employees say that life insurance is simply for burial costs. Since young adults are just starting to grow their families and careers, final expense planning may not seem to be something that needs their immediate attention and, by association, life insurance may not be top of mind. However, this short-sighted view of life insurance can lead to many missed opportunities. Group life coverage can also provide features, such as a tax-favored savings vehicle and value-added services, such as identity theft protection, will preparation, estate resolution services, legal services, and special-needs planning. Fortunately, Gen Y employees are willing and eager to participate in benefit education. According to the study, 54% of Gen Y employees strongly agree that they need more help understanding how their benefits work and how the options can help meet their needs. This far outpaces their counterparts in Gen X (38%) and Younger Boomers (31%). MetLife research also finds that Gen Y employees are looking to their employers for help. Forty-six percent rely on information at the workplace to determine how much they need and 38% are likely to look to an HR or benefit specialist to determine how much they need. Today’s group life insurance products have evolved beyond traditional term life policies that offered a simple lump-sum benefit at the time of claim. The group life insurance landscape encompasses a continually expanding variety of products and features that can be used to tailor these benefits to employees’ needs, meeting the demand for more personalized benefits. Eighty-six percent of Gen Y employees value benefits that are personalized to their circumstances and age. It is worth taking the time to educate these employees about the breadth and depth of products available, as well as the various needs they can address. 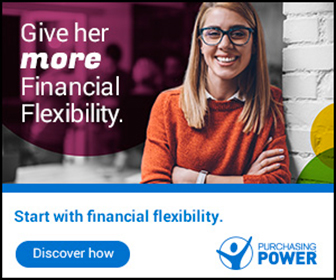 Products, such as group universal life, can also provide benefits, such as a savings vehicle for dependent’s college expenses or for retirement. For older employees, voluntary retiree life insurance allows employees who are entering retirement to extend their coverage into the next phase of their life after they leave the workplace. Additional features further expand the protection available through group life insurance products. Services, such as grief counseling and face-to-face estate resolution services provide employees with needed support during challenging times and may save employees thousands of dollars in related costs if the services were acquired outside of their group life insurance plan. Planning services with access to professional resources, such as face-to-face will preparation, special needs planning and retirement workshops can help employees protect themselves for unforeseen events and prepare for the future. Group life insurance products and their features can help address employee stress and improve productivity by providing needed services, such as face-to-face will preparation, grief counseling and legal services. These services can help ease stress levels, enhance benefit appreciation, and provide employers with knowledge that their employees have the support and protection they need when they need it most. In addition, these value-added services are usually available at no additional cost to the employer or employee. This allows employers to offer a comprehensive benefit package while controlling their benefit costs. Comprehensive benefit offerings also help employers attract and retain top talent. Eighty-seven percent of employers say that retention is a very important benefit objective. The study also found that employees who are very satisfied with their benefits are more than twice as likely to be very satisfied with their jobs. By offering a comprehensive benefit program that addresses employee needs, employers are better able to meet their talent-management objectives. By taking a closer look at the group life insurance landscape and providing employees, especially Gen Y workers, with the education they need to understand their benefits, employers can develop a benefit strategy that enhances benefit satisfaction while providing needed protection. By offering employees group life products that go above and beyond a simple death benefit, employers can provide the personalization that employees want, improving productivity and fostering corporate loyalty. Stephen Pontecorvo is vice president, Group Life Products for MetLife. Metropolitan Life Insurance Company (“MetLife”) is a subsidiary of MetLife, Inc. (NYSE: MET), a leading global provider of insurance, annuities and employee benefit programs. MetLife holds leading market positions in the United States, Japan, Latin America, Asia, Europe and the Middle East. For more information, visit www.metlife.com. Voluntary Benefits – Have You Heard How to Grow Your Voluntary Business? Brokers who are looking for ways to supplement their revenue streams often tell me that they are all ears for new voluntary benefit opportunities. This may be a pun aimed at my hearing insurance background, but it is also recognition that the demand for newer voluntary offerings, such as hearing and long-term care, is far higher than the rate at which they are offered. Employers are offering mainstream benefits at a rate that exceeds interest. In fact, more than twice as many employees would be interested in enrolling in newer specialty care benefits, according to a recent Listen Hear! survey that EPIC Hearing Healthcare conducted among more than 1,500 full-time employees. This provides an important new revenue opportunity for brokers, as well as an opportunity to increase client satisfaction by helping them understand and meet a clearly unmet need. According to the survey, employers are offering mainstream benefits at significantly higher rates than they are offering newer specialty care benefits. Not surprisingly, medical topped the list of benefits at 73%, followed by dental (66%), vision (57%), and 401K (56%). Fewer employers are offering newer specialty care benefits, including long-term care (25%), hearing (15%) and cancer (11%) benefits; as well as other specialty offerings, including legal (13%) and pet insurance (8%). While demand was higher for traditional benefits, it was mostly in-line with or even less than the percentage of employees being offered these benefits. However, there are significant gaps in the demand for newer specialty benefits. While 45% of employees say they would be interested in long-term care, only 25% are offered it, a gap of 20%. While 31% of employees say they would want hearing insurance, only 15% are offered it, a gap of 16%. These gaps reveal that brokers have the opportunity to bring highly valued new voluntary benefits to their clients. Part of the reason for these gaps is that the benefits are newer, so saturation is not as high. Also, employees are recognizing gaps in their general medical care and traditional benefit packages. These gaps are increasingly important to them as they think about their long-term financial security and realize that certain aspects of health care, such as hearing loss treatment or long-term care are not adequately covered by their mainstream benefits. The demand for specialty care benefits is likely to increase as the 80 million Baby Boomers continue to see the effects of aging. More than three quarters of the employees we surveyed said that hearing insurance will become more important as they age, and many are recognizing the need to insure against financial exposure. However, there are many still who don’t understand the financial risks of their future health care. According to a survey by America’s Health Insurance Plans, 28% of people who have not purchased long-term term care insurance are under the mistaken impression that Medicare will cover their long-term needs and another 22% do not know who would pay. Many employees are also misinformed about the coverage of hearing aids, which is the most common treatment accommodation for hearing loss. According to EPIC’s survey, 28% of employees are under the false impression that these products are covered under most medical plans, and 42% don’t know whether they are covered. When approaching retirement, most people focus on making sure that they have enough savings to maintain their standard of living. But they often fail to consider how to manage health care costs. According to the National Institutes of Health, the average price of a digital hearing aid is about $1,500, but can be as high as $3,000 to $5,000. The lack of understanding about what is and is not covered by other benefits reveals an opportunity for brokers to educate clients on the need for voluntary benefits, such as long-term care and hearing insurance. Brokers should educate their clients on how voluntary benefits can protect employees from financial risks and bring a better quality of life. Let’s look at hearing, for example. Hearing loss, which is one of the most common conditions affecting adults, appears to be increasing at alarming rates. The most quoted source on the prevalence of hearing loss in the U.S. is the MarkeTrak survey, supported by the Better Hearing Institute. In the most recent survey conducted six years ago, 34.5 million Americans – or 11.3% of the population – reported a hearing difficulty. This was an increase of 8.8% over the prior survey in 2004. This increase does not simply reflect population growth (the increase in U.S. households over the same period was only 4.5%); it demonstrates that hearing loss is a growing problem. Hearing loss on the rise, and it’s increasing across age groups, which is counter to common misperception that hearing loss is limited to the elderly. According to the Better Hearing Institute, 65% of people with hearing loss are younger than 65. Due to its large size, the Baby Boomer population accounts for the highest number of hearing loss cases of any age demographic. One in six Baby Boomers has a hearing problem. Hearing loss is also an important concern for younger workers, considering that 7.4% of generation Xers (ages 29 to 40) already have at least some hearing loss. According to the survey, 12% of full-time employees are seeking treatment for a diagnosed hearing problem. Another 30% suspect they have a hearing problem, but have not sought treatment. Ninety-five percent of employees with untreated hearing loss say it affects them on the job. The most common complaint is having to ask people to repeat what they said (61%), followed by straining to understand a conversation when there is background noise or other people are talking at the same time (57%). Additionally, 42% of employees often misunderstand what is being said; 40% sometimes pretend to hear when they cannot; and 37% have trouble hearing over the phone. Strain from untreated hearing loss can only hurt productivity due to communication issues. In addition, the extra anxiety and stress brought on by hearing loss can take a toll on the employee’s health and well-being, even contributing to depression. This is unfortunate since hearing aids have advanced so much that people with mild to moderate, and even severe, hearing loss can function as well as the general population. The study reveals that classic barriers, such as stigma and financial concerns, remain for employees who are seeking care. Nearly half of employees say they would be concerned about their employer suspecting or knowing they had hearing loss. There is also the shock of the high cost of hearing aids, especially when most employees realize their medical plans do not cover these costs. When given the facts, employers and employees understand the importance of having healthy hearing to promote health and well-being. Most view it as integral to their job performance as well. Employers can make a positive difference by showing their understanding and support and providing the tools and encouragement to help employees get the care they need. Supplemental hearing health insurance can provide access to a comprehensive network of hearing professionals for yearly checkups, as well as substantial savings on hearing aids from major manufacturers for a very reasonable cost of $.35 to $1.75 per member. As the need for long-term care and hearing health care continues to grow, forward-thinking brokers can be ahead of the curve by providing benefit packages that offer comprehensive coverage and education to help employees minimize risk. Beyond providing access to benefits, brokers and employers can integrate education on the importance of hearing health care into existing health education efforts. If employees are offered health savings accounts (HSAs) or flexible savings accounts (FSAs), brokers can also educate employers and employees that hearing aids are eligible expenses, using hearing aids as an example of an eligible expense during open enrollment presentations, helping to bring further attention to this type of financial assistance. Dru Coleman is the national sales and marketing manager at EPIC Hearing Healthcare. She received her B.S. from Cal Poly Pomona and later earned her life & health insurance producer’s license from the state of California. She joined EPIC in 2006, serving as the national accounts manager, until her recent transition to her current position with EPIC. Coleman also serves as the program manager for the non-profit, AUDIENT, an alliance for accessible hearing care which serves low income individuals through partnerships with state departments of health & human services and vocational rehabilitation. She can be contacted at -dcoleman@epichearing.com. Content for education, including videos, story copy and more, is available free of charge through the Listen Hear! initiative at EPICHearing.com/ListenHear. 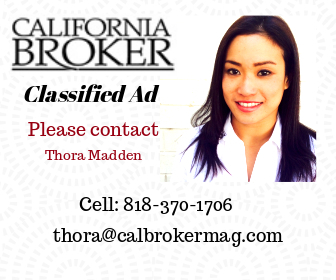 California brokers are well aware that the healthcare marketplace is still in transition. Along with healthcare reform and the Affordable Care Act (ACA) have come many changes, for both employers and employees. Today, your corporate clients are faced with having to share more costs with their employees, resulting in higher out-of-pocket expenses for workers who may already have trouble making ends meet. Although in the past California employers preferred to offer HMOs and were slow to adopt high-deductible medical plans, they are now starting to move to these plans. The result is that employees will increasingly be exposed to medical expenses they did not have to pay for previously. One hospital admission, for example, could cause a serious financial setback due to costs not covered by a typical medical plan, such as co-pays, co-insurance and deductibles. • The average cost of a hospital stay is $9,700. • The average price for inpatient hospital admissions rose 5.3 percent in 2011, outpacing the rate of inflation at 3.2 percent. • Nine out of 10 workers with medical coverage have an out-of-pocket maximum for individual/single coverage. • Seventy percent of those workers have an out-of-pocket maximum of $2,000 or more. • Forty-four percent of individuals don’t have at least $2,000 in emergency savings. • The bottom line, then, is that most workers wouldn’t have enough money to pay their out-of-pocket costs for a hospital stay if they required one. Fortunately there is a solution that can benefit everyone involved — you, your clients, and their workers. Hospital indemnity insurance is designed to help protect employees from the financial costs of unexpected health events that result in hospitalization or other treatment. For employers, it’s an opportunity to relieve some of the financial pressure by offering their workforce access to reasonably priced coverage that can supplement their medical plans. In addition, hospital indemnity insurance can help your clients meet their benefit plan objectives at no cost to their bottom line since it is voluntary coverage that employees purchase through payroll deduction. Group hospital indemnity coverage is intended for all employees, particularly those earning $25,000 to $80,000. With no age restrictions, the coverage is an excellent option for families or individuals at all stages of life, whether they would have a difficult time covering hospital costs due to a lack of savings or because they are facing a catastrophic health event. Because the coverage is simple and easy to understand, employees need to make only two decisions at enrollment time: do I want this coverage? and who do I want to cover? When an insured individual is admitted to the hospital, hospital indemnity insurance pays a lump-sum benefit regardless of the cost of care. This benefit can be used to cover out-of-pocket expenses such as co-payments, co-insurance, deductibles or any other costs associated with hospitalization — or however the covered individual chooses. Typically, carriers offer three to five employer-elected plan designs that complement major medical plans, including an HSA-compatible design. All plans feature a hospital admission benefit selected by the employer ranging from $500 to $5,000, with a typical benefit selected by California employers of $1,500. In addition, plan design options can include outpatient and inpatient surgical benefits and a diagnostic procedure benefit to tailor a plan that fits workplace needs and provides financial protection. Employers can also choose to offer a menu of optional benefits, including daily hospital confinement; hospital intensive care unit confinement; rehabilitation unit confinement; ER treatment; a wellness benefit and portable coverage. Employees, spouses, and children can also be covered under the employee plan if an employer chooses, and the employee must be covered to apply for spouse/child coverage. In addition, employers can choose to make the plan portable, providing employees with coverage continuation that requires no new health questions or changes in rates. The ported coverage can remain in-force even if the master policy terminates. In advising your clients about desirable product features in a group hospital indemnity plan, you may want to suggest coverage that pays a larger upfront benefit upon admission with a smaller daily benefit; offers a simple plan design with a lump sum not tied to the employer’s medical plan; provides coverage for childbirth; emphasizes flexibility so the employer can easily customize the offering; is designed to complement most medical plans, including both PPO and high-deductible health care plans and is HSA-compatible. Enrollment support will also be a critical element of any hospital indemnity plan your clients offer. The carrier should be able to offer a full range of enrollment options, including face-to-face meetings; a call center; online tools; plug and play messages; and personalized paper kits. The key is to ensure that whatever method is selected matches those communication methods the employer already has in place and with which employees are comfortable.